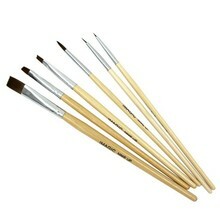 This is a face body paint brush set containing 6 pcs sizes brushes Offers smooth blending the wonderful layering sense. The soft brush hair is comfortable to contact with your skin without irritation. Strong powder grasp ability provides even distribution for doing makeups easier and maintain for long lasting effect. Easy grip wood handle is light and easy to hold steady while you’re working. Perfect for makeup party, performance and other usages. Mixed set of 6pcs paint brushes including eye brush, lip brush, face brush and body brush for your full use of them. Strong powder grasp ability, which provides even distribution for doing makeups easier and maintain for long lasting effect. Offers smooth describing and blending the wonderful layering sense. Easy grip wood handle helps is light and easy to hold steady while you’re working. Small head brushes are intended to describe complex pictures at ease for more delicate styles. Portable sizes of brush for convenient carrying when you are outdoors or on travel. Ideal for acrylic watercolours oils and detail painting.